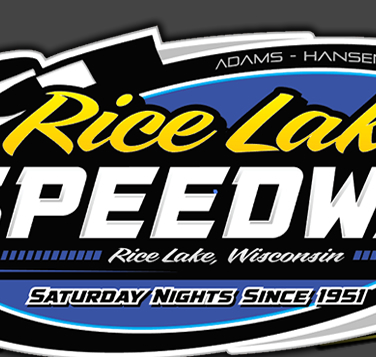 RICE LAKE, WI (August 15) - Fifteen year old Austin Ellis won his first ever feature race to highlight the racing action Saturday night at the Rice Lake Speedway on a hot and sticky evening. Other feature winners during the second to the last point program of the 2015 racing season included C.J. Wagner, Kevin Bogdanovic, Mike Anderson and Kevin Adams. Ellis, the second year Midwest Modified driver, had won a B feature race last year in his rookie season, but had never won a main event until Saturday night when he held off the challenges of current national point leader Shane Halopka to record the memorable win. The opening laps of the Midwest Modified feature saw Nathan Thums and Reid Tiegs race wheel to wheel for the lead with both drivers holding the top spot briefly. The yellow waved with two laps complete, the only slowdown of the event. On the restart, Ellis came charging up from his third spot and passed both competitors as he took over the lead. Once in front, he began to build his advantage as Tiegs and Thums now battled with Travis Anderson, Ryan Viltz and Halopka for position. Ellis continued to stretch his lead while the battle for second intensified, with Halopka going to the high side of the track to eventually move into second. Halopka then set off after the leader, gaining some ground for a few laps but then, the lead seemed to stabilize as Ellis was putting down some good laps. As the laps ran down, everyone expected Halopka to put on a charge and narrow the lead, but Ellis continued to drive a brilliant race as the lead remained at eight car lengths. The final lap produced another strong effort by Ellis and he drove home unchallenged for the win, to the vocal approval of the crowd. Anderson took the third spot with Viltz and Tiegs completing the top five. Wagner took his fourth feature win of the year in the Pure Stocks as he continued his battle with Nick Traynor for the track point lead. Tucker Quinn, on a night when his Grandfather was inducted in the Rice Lake Speedway Hall of Fame, led the opening laps of the Pure Stock feature with Wagner, Traynor and Shawn Amundson challenging. On lap four, Traynor and Amundson were furiously battling for third when Amundson went around, triggering the first yellow of the race. Only one more lap would be run before another spin slowed the action, but the last eight laps went nonstop. Wagner was able to get under Quinn on the green and he took over the lead while Traynor and Jason Havel, coming from the fourth row, were both charging into the top three. Traynor pulled in and began to challenge Wagner for the lead while at the same time, Havel moved into to put the pressure on also. After having Traynor nailed to his rear bumper, Wagner was able to open back up a two car length lead, which he held to the finish by making no mistakes that would give the challengers an opening. Traynor held on to nip Havel for second by inches with Amundson working his way back up through the pack to fourth ahead of Mike Grover. Bogdanovic had to withstand intense pressure from Adam Soltis and Cody Kummer to win his second feature race of the 2015 season. Bogdanovic started on the pole but the race was anything but easy for him, as Soltis quickly moved into second and found himself nailed to Bogdanovic's rear bumper and pressuring for an opening. Kummer moved to the high side of the track and pulled up beside Bogdanovic on several occasions, but could just not complete the pass for the lead. Much of the race saw the top three running in formation as Kummer and Kori Richter behind him continued to try the high side. A late spin would bunch the field for a four lap sprint to the finish but Bogdanovic would put in his best laps of the race late, as he was able to open a car length lead and no matter what Soltis tried, Bogdanovic kept his line as he drove on for the win. Kummer settled for third with Sam Fankhauser and Richter following. Anderson won his second Super Stock feature of the season as he held off Jason Forehand for the hard earned victory. Derek Baskin led his first feature laps of the season as he was the early leader until being passed by John Erickson. Erickson was running well on the high side of the track and he also held the lead for several laps until Anderson was able to overtake him on the low side for the top spot. Erickson continued to battle back and try to regain the lead, but he was soon joined by Forehand and Eric Olson in the battle for the lead. Forehand eventually got to Anderson's rear bumper while Olson moved to the high side and threatened to pass both on the long way around the track. Anderson continued to hold the lead but he couldn't put any distance on the field, with Forehand continuing to pressure him in each corner and Olson still trying to sneak by on the top side. While these three were battling, they seemed to be slowing each other down, and Scott Zitelman was quickly closing in, gaining ground on all three of the leaders. Forehand jumped up to the top side of the track near the end of the race, and he made an all out run on the final lap, drawing up beside Anderson in the last corner but not having quite enough to complete the pass as Anderson kept his line and held on for the win. Zitelman completed his charge as he nipped Olson for third with Bart Steffen coming from the rear to finish fifth. Adams earned his sixth feature win of the season after a hard fought battle with Mark Hessler that lasted right up to the checkered flag. Tim McMann jumped from the outside pole to take the early lead and with the race staying green, “McAnimal” was able to open up a nice sized lead on the field. Meanwhile, Adams was working his way up from his eighth starting spot, and he caught the second running Hessler and they had a pitched battle for the position. Finally, Adams was able to slip past Hessler on the high side leaving turn four with a breath taking move and he drove into second. The race had only one yellow, for a spin with nine laps complete, but that slow down cost McMann his built up lead, and one lap after they returned to racing, Adams drove past McMann of the high side to take over the lead. One lap later Hessler was able to do the same and the battle for the win was on. Adams continued to lead but in each corner, Mark would try to slide under Adams and take over the lead. He came close on several occasions but each time, Adams would be able to beat him out of the corner and retain the lead. Hessler took one last shot on the final corner with a strong low dive, but again Adams beat him out of the corner as he drove on for the win. McMann finished a strong third with Matt Leer and a charging Mike Anderson just behind them. 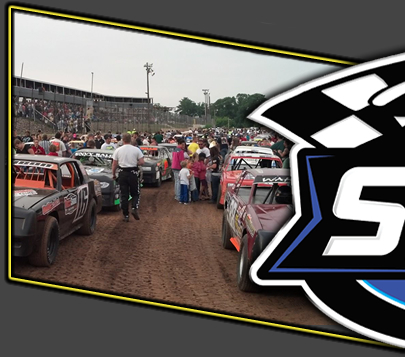 The final night for track points will be held next Saturday, August 22nd with the race for the points title in both the Pure Stocks and Street Stocks very close with Traynor still holding a very small lead over Wagner while Kummer extended his lead slightly over Hunter VanGilder Saturday, but their race is still to be decided. Halopka, Forehand and Adams remain comfortably ahead in their divisions. Season Champions will be decided on Saturday, August 29th with the season to conclude on Saturday, September 5th. 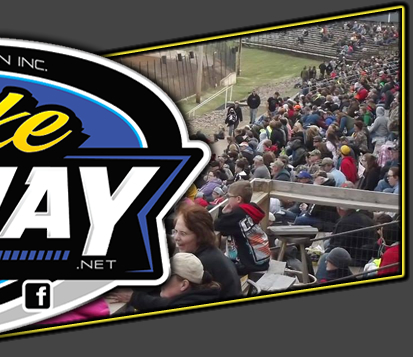 Unable to secure the Sunday date that would have made the Labor Day weekend show a doubleheader, the final show will be a one day show on September 5th with details about the event to be announced shortly. Bike races, which were rained out on August 8th, have been rescheduled for August 29th to be a part of the Season Championship night. As always, warm ups start at 6:30 p.m with racing to follow.